I’ve not yet used wooden blockers. I also haven’t used wire clothes hangers to make my own homemade blockers. (Well, I did try and I hated how they looked and couldn’t get them into a shape that didn’t seem too big or too small.) So I can’t compare the kind I have with other types. I’ve had these blockers (made by Fiber Trends in a Sintra/PVC material) since November or December 2005, just a few months. I’ve used them to block socks for gift-giving and photography. I’ve been happy with them so far. They don’t get wet from the socks (they always feel dry), are odorless, and are very lightweight. I did wonder if they could be broken, but I haven’t even tried putting extreme stress on them. Anyone know if it could happen? I put aside some of my budget to splurge on the Medium and Large sizes and I’m glad I did. Especially because I think these will last, and last. If you don’t want to splurge, you can try making your own with this tutorial. I got a package in yesterday’s mail with knitting-related goodness from eBay. 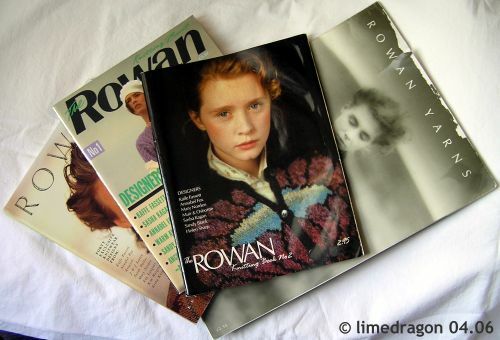 I think the picture will speak for itself: Rowan Magazines! I lucked out on an auction for these four publications together. The big oversize booklet got a wee bit damaged during shipping, bummer! But the important parts, the pictures and patterns are all intact! There are a lot of baggy oversize sweaters, which isn’t surprising because these are from the ’80s, but I’ve found some gems and interesting items I want to knit. Sometime I’ll go through each and list them (for easy, future reference) here. I don’t believe there’s much info at the Rowan site about the back issues, at least, not that I could find, so I may scan a few pictures. Congrats on scoring the rowan mags! They have such great designs and many stand the test of time.